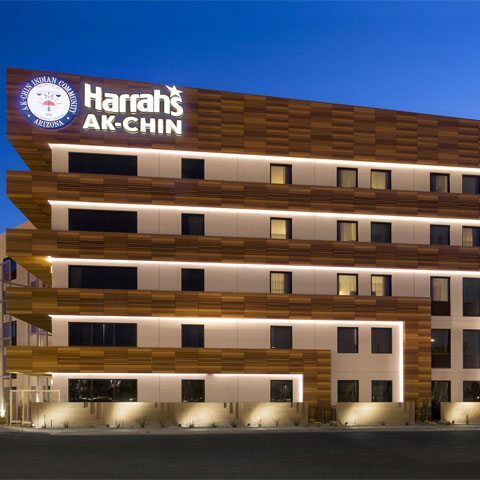 Looking for the excitement of a casino, with the relaxing ambiance of a first-class resort, both can be found at the same place: Harrah’s Ak-Chin. When you’re not playing one of your favorite games, you can settle into one of our 300 luxurious guestrooms, which come complete with all the amenities to make your stay a comfortable one. The hotel grounds are a verdant oasis, boasting a lush assortment of greenery, including an idyllic courtyard with an exotic swimming pool and swim-up bar. At Harrah’s Ak-Chin, you’ll find a first-class heated pool open year-round. The courtyard swimming pool complex at Harrah’s is lined with palm trees and features luxurious amenities like a hot tub, our swim-up bar that even serves lunch items. Pull up a lounge chair, enjoy the sunshine and splash down into fun! When you visit Harrah’s Ak-Chin, you’ll find the very best selection of Phoenix video poker and slots, with 1,089 games in denominations that range from pennies to high-limit $25 machines. Whether you prefer classic spinning reels, the latest video themes, multi-line games, video poker, progressives, multipliers or bonus rounds, you’re certain to find a Harrah’s Phoenix slots favorite. The casino is 40,000 sq. ft. floor that features classic games like blackjack as well as more unique experiences and side bets sure to satisfy any urge for adrenaline. Our seasoned dealers are there to make sure that playing your favorite table games at Harrah’s is always a good time.